Enter the feet, inches, and fraction of an inch, and then click the Convert to Decimal button. You can then copy the appropriate decimal and paste into the circle calculator. If you need to convert a tape measurement into a decimal number, tap the button in this row to expand the converter. Select how many decimal places you would like the result rounded to. Note that you can change the number of places before or after calculating the circle measurement. Also note that the circle calculator will always display the raw results (out to 14 places) in the steps that will appear beneath the calculator. Select the known value and just start typing. Select the known circle measurement from the drop-down menu and then enter the selected measurement in decimal format. The circle's area (A) will be calculated as you type. Click the Clear button to clear both fields. If you know the area of the circle and would like to calculate the circumference, diameter, and radius, enter the area on this line. Enter only digits 0-9 and a decimal point (if applicable). Non-numeric characters will not compute. Or, tap the plus (+) to expand the mini calculator if you need to find the area. Note that the area of a circle is expressed as the square of the particular unit of measurement being used (square mm, square inches, etc.). Select the known circle measurement from the drop-down menu and then enter the selected measurement in decimal format. 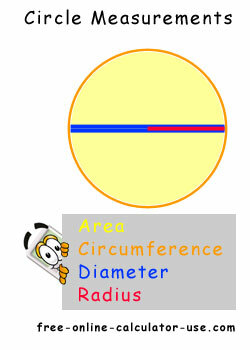 The circle's circumference (C) will be calculated as you type. Click the Clear button to clear both fields. If you know the circumference of the circle and would like to calculate the area, diameter, and radius, enter the circumference on this line. Enter only digits 0-9 and a decimal point (if applicable). Non-numeric characters will not compute. Or, tap the plus (+) to expand the mini calculator if you need to find the circumference. Select the known circle measurement from the drop-down menu and then enter the selected measurement in decimal format. The circle's diameter (D) will be calculated as you type. Click the Clear button to clear both fields. If you know the diameter of the circle and would like to calculate the area, circumference, and radius, enter the diameter in the field on this line. Enter only digits 0-9 and a decimal point (if applicable). Non-numeric characters will not compute. Or, tap the plus (+) to expand the mini calculator if you need to find the diameter. Select the known circle measurement from the drop-down menu and then enter the selected measurement in decimal format. The circle's radius (r) will be calculated as you type. Click the Clear button to clear both fields. Or, tap the plus (+) to expand the mini calculator if you need to find the radius. Enter the decimal number, tap Feet or Inches, select the maximum denominator, and then click the Convert to Feet/Inches button. The converter will round the fraction portion to the selected denominator and then reduce it to simplest form. If you need to convert a decimal to a tape measurement, copy a decimal from the above results and tap the button to expand the converter. Enter the decimal number you would like to convert into a tape measurement. This geometry calculator will take one known circle measurement (area, circumference, diameter, or radius) and calculate the other three. Plus, unlike other online circle calculators, this calculator will show its work and give a detailed, step-by-step explanation of the formulas and sequence used to arrive at each result. ... and 2 conversion calculators for converting between tape measurements (feet/inches) and decimal numbers (one button appears at the top of the calculator and the other appears at the bottom). 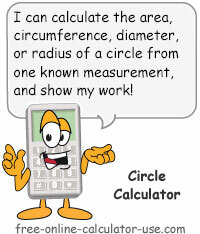 If you are unfamiliar with the common measurements used in plane circle geometry, it may help to visit the Learn tab to learn about them before using the calculator. Select the number of decimals places you would like the calculated measurements rounded to. Enter the known circle measurement into its corresponding field, and make sure the other three measurement fields are empty. Tap the "Calculate Circle" button. This will calculate the values for the unknown measurements, plus display the formulas and steps the calculator used to solve for them. Common circle measurements and how they are found. Here is brief, color-coded description of each of the four common circle measurements. All of the area within the boundary of the circle, expressed as a square of the unit of measurement (square mm, square feet, etc.). The area can be found by multiplying PI (3.14159) times the radius times the radius again. The distance around the outward boundary of a circle, expressed as a linear unit of measurement (millimeters, inches, etc.). The circumference can be found by multiplying PI (3.14159) times the diameter. The length of a straight line that intersects the center point of the circle and reaches to each side of the boundary. Diameter can be found by multiplying the radius by two, or by dividing the circumference by PI (3.14159). The length of a straight line drawn from the circle boundary to the center point of the circle. The radius can be found by dividing the diameter by two, or by finding the square root of the quotient resulting from dividing the area by PI (3.14159). Note that the formulas used for finding each measurement will be listed in the calculator results.